Home » Daily Post » Sarbat Khalsa 2015 » Sarbat Khalsa 2015 is On 10th Nov. at Amritsar-Tarn Taran Road, Village Chabba, Amritsar. Sarbat Khalsa 2015 is On 10th Nov. at Amritsar-Tarn Taran Road, Village Chabba, Amritsar. In the other, historical, sense, Sarbat Khalsa is the highest organ of the Khalsa Commonwealth representing its “integrated will,” which no Sikh commoner,sardar or prince could dare defy. Sarbat Khalsa, meeting in the presence of the Guru Granth Sahib, is the supreme sovereign body, with deliberative and executive powers, including authority to direct the affairs of the community. The institution of Sarbat Khalsa grew out of the needs and compulsions of the turbulent eighteenth century when Sikhs, were driven away from their homes and were forced to find shelter in remote hills and forests in large or small batches. The able-bodied baptized Singhs among each group formed a fighting band, living off the land in defiance of the imperial might. It became customary for these bands of Sikhs to assemble yearly at Amritsar, especially on the occasions of Baisakhi and Diwali. These gatherings of warriors and noncombatants who were soon considered to represent the entire Panth came to be known as the Sarbat Khalsa. In this general sense, Sarbat Khalsa denoted, as it still does, the entire body or the whole commonwealth of Sikhs in whose name ardas or the supplicatory prayer was offered individually or at public congregations. The Sarbat Khalsa discussed and took decisions by common counsel upon matters of policy and upon matters requiring action. Reports on the activities of different jathas or groups were taken note of and strategies in respect of their continued resistance against Mughal and Afghani oppressors who sought their conversion to Islam, as well as their relationship with friendly powers such as the Jats and the Marathas. The earliest known meeting of the Sarbat Khalsa took place on the occasion of Divali in 1723 when a clash between Tat Khalsa and the Bandais (owing fealty to Banda Singh Bahadur) was averted and amicably settled through the intervention and wise counsel of Bhai Mani Singh. to eliminate government informers and lackeys. Another Sarbat Khalsa assembled in 1733 to deliberate upon and accept the government’s offer of a Nawabship and jagir to the Panth. Under a gurmata of the Sarbat Khalsa on 14 October (Divali day) 1745, the active fighting force of the Sikhs was reorganized into 25 jathas (bands) of about 100 each. A further reorganization into 11 misls (divisions) forming the Dal Khalsa was made by the Sarbat Khalsa on Baisakhi, 29 March 1748. Thus, Sarbat Khalsa became the central body of what J.D. Cunningham, in his book, A History of the Sikhs, terms a “theocratic confederate feudalism” established by the misls. 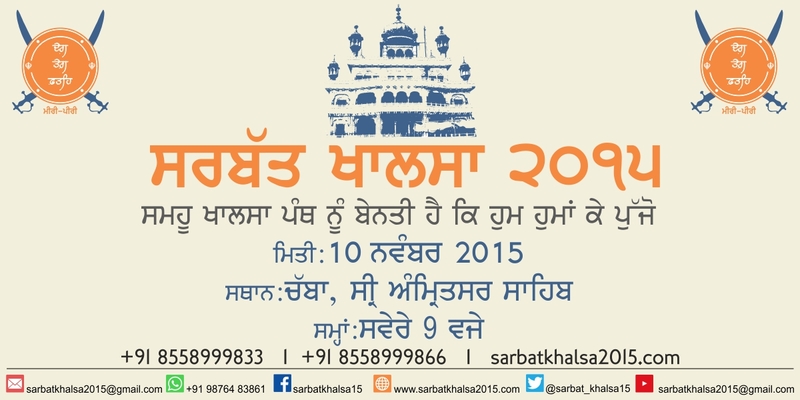 Sarbat Khalsa 2015 is going to be held on 10th November 2015 at Amritsar-Tarn Taran Road, Village Chabba, Amritsar. Punjab Govt. Has Demanded 25 Companies Of The Para Military Forces From The Central Govt.